The recent measures announced by the Reserve Bank of India to stabilize the rupee are unlikely to provide comfort unless the economy’s fiscal deficit issues are tackled, say analysts. Prime Minister Manmohan Singh, who has taken additional charge of the Finance Ministry today held discussions with Planning Commission deputy chairman Montek Singh Ahluwalia and chairman of the PM’s Economic Advisory Council C. Rangarajan to take stock of the economic situation. UK lender HSBC on Tuesday offered its entire stakes in Axis Bank and Yes Bank through share sales worth up to Rs 24.5 billion, according to a term sheet obtained by Reuters. Looking to expand its footprint in India, General Motors India has planned to shuffle its product with some models being phased out while some other in the launch line with India specifically in mind. 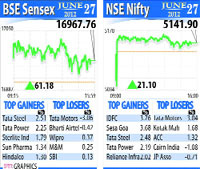 Both Deutsche Bank and Standard Chartered expressed their positive stance on Indian equities. Deutsche Bank upgraded Indian stocks to 'overweight' from 'neutral', saying the market is close to its cheapest in two decades from an EBITDA and sales perspective. Industry here wants the Haryana government to regularize “nonconforming” areas in the city’s residential zones where small scale and tiny manufacturing units have come up in a big way. If the government agrees it would have to regularize at least 30 such areas to accord them “industrial area” status. Morgan Stanley has maintained its "underperform" rating on State Bank of India, with a target price of Rs 1,425, after a meeting with the management of the country’s largest lender. Mobile number portability (MNP) is proving to be a success with the continuous rise in the number of requests being received by telecom operators as they face a saturated urban market that has, for the first time in April, seen a decline not only in the wireless subscriber base but in the overall phone subscriber base. According to Kotak Equities, measures announced on the overseas borrowings side, it is not likely that flows will increase as the additional limit for external commercial borrowings (ECBs) of US $10 billion is clearly towards new capital expenditure and unlikely to take off in the current economic environment. Further, the increase in the government securities (g-sec) limit of $ 5 billion is for investments into papers with residual maturity of three years. Additional investments from foreign sources will also increase the external debt of the economy. Investors’ expectations now logically rest on the government to announce measures to contain the fiscal that might provide the central bank with room to reduce policy interest rates. According to the report, the RBI has allowed Indian manufacturing and infrastructure companies with foreign exchange earnings to access ECBs (overall ceiling of such ECBs increased to $10 billion) to repay outstanding rupee loans towards capital expenditure and fresh rupee capital expenditure under the approval route. “We believe this is unlikely to be significant for the investment cycle as such and could be used more for refinancing of existing loans for the industrial sector companies. The need of the hour is for the government to act constructively to remove the supply-side bottlenecks through a more stable and certain policy outlook”, it said. One measure could be to address the issue of current expenditure under the fiscal (example subsidies and interest rate burden), thereby helping investment demand to pick up by preventing crowding out of the private sector. The relaxation of the ECB limits in itself might not help immediately as Indian companies may not be to able to raise loans from abroad at a reasonable cost given both domestic fundamental weaknesses (implying a negative ratings watch) and weak global banking scenario (deleveraging of global banks). The markets are clearly unhappy with the measures and there could be one-shot upside to the INR once the additional limits under g-sec route are auctioned, but the momentum is unlikely to sustain. Ever since the FII (foreign institutional investors) debt limit was increased in December, the rupee has moved down from 50 to 57, implying more “fundamental” reasons for the rupee’s weakness. Ahluwalia and Rangarajan briefed the prime minister about the economic situation and both of them are likely to play a pivotal role in economic policy making. Singh will also meet senior Finance Ministry officials including finance secretary R.S. Gujral, economic affairs secretary R. Gopalan, financial services secretary D.K. Mittal and chief economic advisor Kaushik Basu. Singh, who is acknowledged as the architect of economic reforms in India is taking charge of the finance ministry at a time when GDP growth has slowed down, rupee has formed a new low of 57.15 to a UDS dollar, inflation is high industrial growth is weak, fiscal deficit is high and investor sentiment is poor. He took charge of the finance portfolio yesterday following the resignation of Pranab Mukherjee, who is the UPA's candidate for the presidential election. The markets and analysts are expecting the prime minister to initiate the next wave of reforms to improve market sentiment. Several changes in officials of the finance ministry are also expected in the coming days. HSBC offered 19.6 million shares in Axis Bank for Rs 950.9-970.9 each and 16.8 million shares in Yes Bank for Rs 318.1-324.8 per share through its Mauritius subsidiary, the term sheet said. Speaking to reporters at the launch of the all-new diesel variant of its Cruze premium sedan, priced between Rs. 13.85 lakh and Rs. 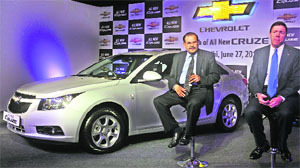 15.67 lakh (ex showroom, Delhi), GM India president & managing director Lowell Paddock said the company has enhanced focus on small cars unlike other BRICS countries as vehicle sales in India generated comparatively lower profit margins and fuel prices kept fluctuating. While the Aveo UVA hatchback and Aveo notchback are being phased out by the third quarter of this year when the company will launch the Sail hatchback and notchbacks. Sail, a product from the GM-SAIC joint venture in China, has been modified to suit Indian conditions. Paddock said the modifications in the Sail have been done keeping India in mind where temperatures in summer tend to touch 47 degrees C and more. The modifications have been done over the last two years and the car is now ready for a launch. The two variants would be in the market during the third quarter festival season months and the hatchback is being positioned in the premium hatch segment like the Maruti Swift. Meanwhile the company has decided to postpone the launch of GM’s first light commercial vehicle in India, which was again being developed in partnership with the SAIC of China. Paddock said no new timeline had been set for the LCV launch right now since the market for commercial vehicles was not very promising. Plans to develop a car between the Chevy Spark mini and the Beat hatchback had also been put on the backburner. He also acknowledged there had been a decline in sales of the Spark month-on-month. “This car has been ageing and also, the mini segment as a whole has been declining. We plan to bring a refreshed Spark by the end of the year,” Paddock said. The new Spark may support a new 800 cc engine like that of the Hyundai Eon and the new Maruti 800. Incidentally, like other manufacturers GM’s two plants, in Talegaon, Maharashtra and Hallol, Gujarat have also been observing some no-production days to align supplies with falling demand. "The angst over falling Indian economic growth is so yesterday," wrote strategist Ajay Kapur in the report dated on Wednesday. "We think a risk-on environment could see a return to value," he added. Kapur said sentiment for India is "in panic mode" even as historical valuations have become attractive and technicals are robust. Deutsche Bank's India strategists have an end-year target for the Sensex at 18,000 points. The upgrade comes after JPMorgan upgraded Indian stocks to "overweight" last week. The investment bank said "asset quality pressures will intensify" in the fiscal year ending in March 2013, while the "flow of bad loans will be lumpy." Morgan Stanley said the SBI management indicated gross and net new nonperforming loans in the first quarter of the fiscal year could be at Rs 50 billion and Rs 30 billion, respectively. The bank’s management expects net interest margins to remain flat quarter-on-quarter in the June quarter, and fall by 10-15 bps to 3.7-3.75% in FY2013, while expecting loan growth of around 15%, according to Morgan Stanley.